As growers, we do not have control over everything that happens. The main thing outside of our control is the weather, and it’s only going to get more chaotic as climate change bites. Heavy rain events can leave soil impossible to work, because the water can’t drain away fast enough. What can we do when it’s too wet? Laura Lengnick in Resilient Agriculture views climate change as yet another production risk to assess and prepare for. The vulnerability of your farm has two components: exposure and adaptive capacity. As far as exposure, the most immediate key exposure is water issues (too much and too little). As for adaptive capacity, the main feature is our personal capacity to respond and plan. We need to pay greater attention to the climate as a critical factor in our decision-making. See Weatherspark.com for easy-to-understand graphics showing the average weather in your locality. Figure out which crops are most marginal already in your climate, and decide whether they are worth keeping in your crop portfolio, and whether they are important enough to be worth providing more protection for. Using raised beds can help excess water to drain sooner. Raised beds will drain and be ready to plant sooner after rain. Increasing the organic matter content of the soil helps it absorb more water in a manageable way, without compacting and going anaerobic. Compost improves the soil structure, organic matter and humus. The effects last longer than cover crops and crop residues, especially in humid conditions where the breakdown of plant material is very rapid. Maximize the volume of living roots (food crops and cover crops) throughout the soil profile (use both deep-rooted and shallow-rooted crops). Cover crops. The root channels improve the soil structure — fine roots make up 70% of the root biomass of crimson clover, vetches, and field peas, and when the cover crops are mowed, these roots support microbial growth, form active organic matter, and rapidly release N to the plants. Keeping roots in the soil all the time, or as much of the time as possible, will help prevent erosion. Consider no-till cover crops which become mulch. 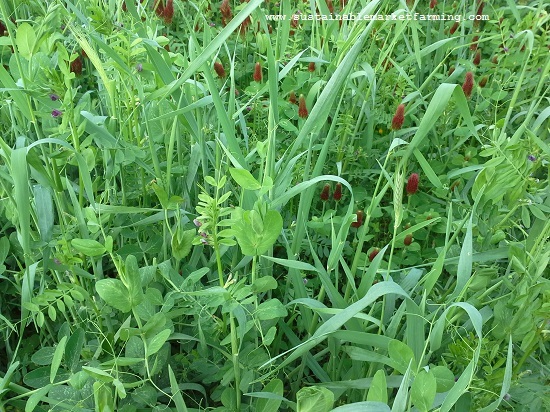 A no-till cover crop mix of winter rye, hairy vetch, Austrian winter peas and crimson clover. Avoid “bare fallow” at times of year when you could get a lot of rain. That might mean not just hurricane season, but year-round. Low-growing non-invasive cover crops can be planted in pathways. Minimize tillage because tilling accelerates nutrient burn-up and hence the loss of organic matter. Avoid tilling or disking right before a forecast of heavy rain. If water drainage is a big issue where you are, you may need to consider a “grassed waterway” Your NRCS office can help with the design. See their publication Grassed Waterway and Vegetated Filter System, Conservation Practice Job Sheet 412. This is really a very large gradual swale with a grassed surface, which you can mow (think home-grown mulch!). Another option is a “drywell” or French drain, a big hole full of rock. We calculated that for our hoophouse, ours would need to be 11′ × 11′ (3.4 × 3.4 m) and 4′ (1.2 m) deep. It would have been a big area and a lot of rock (and money), and not inconsiderable maintenance to keep it free of sediment and leaves. Swales (also called “infiltration trenches”) allow water to gradually seep into the soil, while sending sudden large volumes downhill to an area which can absorb more water. A swale 18″ (45 cm) wide by 8″ (20 cm) deep in averagely draining soil can infiltrate approximately 1.6″ (4 cm) rain per hour per 20 ft2 (1.86 m2) of contributing area. 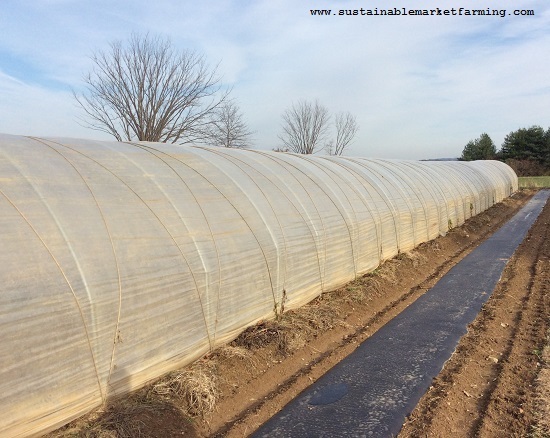 A caterpillar tunnel and a plastic mulched bed at Potomac vegetable Farms in November. Physically cover the soil: hoophouses and caterpillar tunnels can help keep crops from deluges. Large structures do have the issue of runoff, but you can plan ahead for that and make a drainage system. 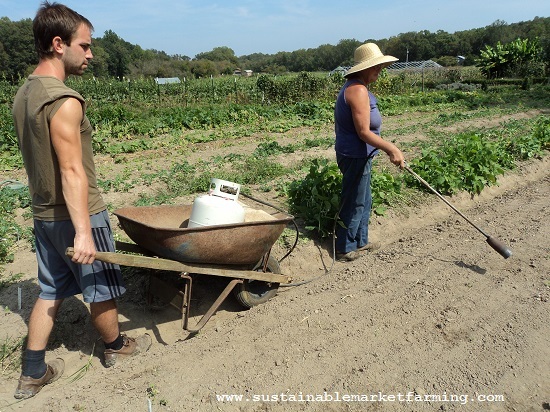 When we built our hoophouse, we made a ditch around three sides of it, to channel runoff downhill. Some people who have roll-up or drop-down sidewalls install plastic guttering on the “hipwall” lumber that these structures need, and collect the rainwater for irrigation. Bear in mind that the water catchment barrel will be low down and the water will need pumping or dipping and hauling to be useful. Read the NRCS Code 558 Roof Runoff Structure. Before the storm moves in, cover the soil where you plan to plant: temporary caterpillar tunnels (field houses), low tunnels, plastic mulches and tarping (occultation) can keep some of the soil dry, at the expense of causing runoff that makes other areas wetter. This can help get crucial plantings done in a timely way, leaving the wider problem to resolve later. 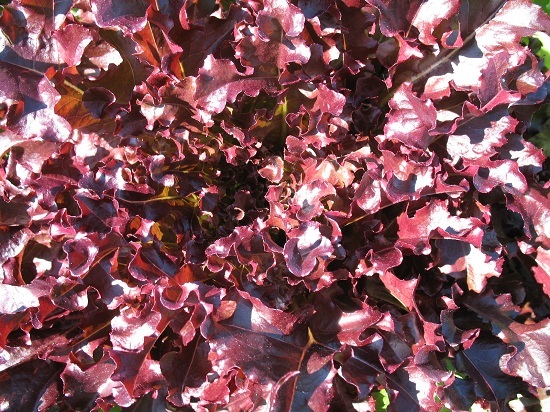 Fast-growing Red Salad Bowl lettuce. Consider transplanting instead of direct seeding. We did this one year with our winter squash, when the plot was hopelessly too wet. We were able to transplant the squash fairly young, and did not have a big harvest delay. Consider a different, faster, variety that you can sow later and catch up. Some leaf lettuces only need 46 days (Salad Bowl, Bronze Arrowhead, Tom Thumb), while Romaines can take a lot longer (Crisp Mint, Winter Wonderland 70 days, Webb’s Wonderful 72 days). Baby lettuce mix can be ready in as little as 21 days from mid-spring to mid-fall. One summer we sowed Tokyo Bekana as a lettuce substitute. 20 days to baby size, 45 days to a (large) full size. Also ready in 30–35 days are spinach, chard, salad greens (lettuce, endives, chicories) and winter purslane. Ready in 35–45 days are corn salad, land cress, sorrel, parsley and chervil. Ready in 60 days are beets, collards, kohlrabi, turnips and small fast cabbages (Farao or Early Jersey Wakefield). The International Cooperators’ Guide Grafting Tomatoes for Production in the Hot-Wet Season recommends using eggplant rootstocks for tomatoes when flooding is expected. Could you mow? This will prevent weeds seeding, and prevent the cover crop or previous food crop from getting any bigger. It will be easier to till once that does become possible. If you can’t get a mower across the beds, can you use a weed whip (string trimmer) or a manual weed whacker or a scythe? This will buy you some time. Could you use a broadfork? This will open up the soil, allowing it to dry faster. 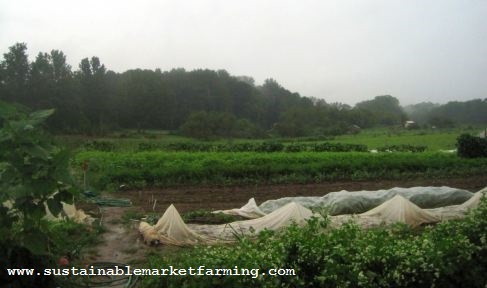 Could you lay tarps over the whole mess, and wait for the cover crop or weeds to die? Could you use a flame weeder to kill the existing vegetation? Flamers are intended to kill small weeds, not big ones, but we successfully used our wand-type flamer to kill weeds in the potato patch one spring when it was too wet to hill the potatoes. If your soil floods, drain it promptly, or you may end up with drowned plants (insufficient air) and with a high salt level caused by evaporation. Dig shallow trenches to let the flood water flow away. After the flood recedes, you could lose yield from loss of soluble nutrients. The soil may have become anaerobic, reducing available nitrogen. If you have a suitable source of nitrogen, apply some. 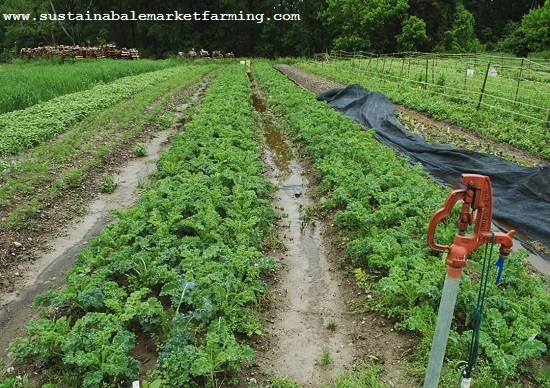 You may also get a flush of weeds, competing with your slow-to-recover crop. See How to Rehab Your Soil after a Flood on the Hobby Farms website for five steps to repairing the damage: Clean Up, Remove Water, Beware of Contamination, Level the Land, Rebuild the Soil with Cover Crops. See also the Carolina Farm Stewardship Association’s Expert Tip: How to Handle Flooded Fields for information about food safety. There is more about dealing with floods and disasters in general, in The Year-Round Hoophouse. very wet in pacific northwest US recently, thanks for the tips Pam! Hi Patrick, Sorry to hear that. Hope you can find some help in these ides. let us know of anything else you come up with!